I have the next couple of days off for the beginning of Pesach (Passover), so I decided to sleep in a bit. Though the kidz did their regular routines to try to get me up, they did resign themselves to waiting me out a little. They watched the morning news and waited for me to stir. This made us smsile, and we love th Cherry Blossom post! 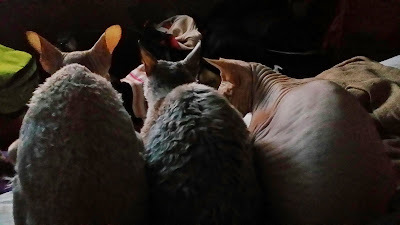 We nominated you on our blog as we love the Sphynx cats.